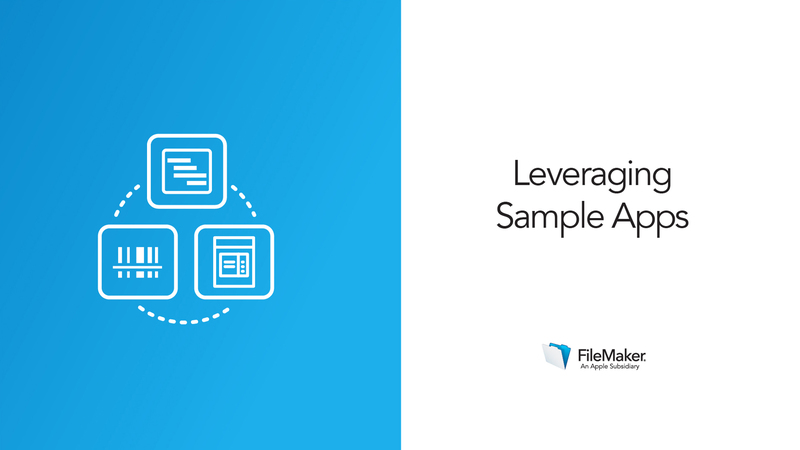 FileMaker Pro Advanced comes with a number of Sample Apps, to give you an idea of what your custom app can do. Sample Apps focus on common business problems, and are optimized for all of the FileMaker platform. Sample Apps are easy to find and ready to use. You have full access to modify and use them any way you'd like — you can use them to get a feel for the FileMaker platform, or dig in to the different features to get ideas for your own custom app. They can help you learn how apps are constructed, and give you ideas and inspiration. In this video, you'll explore three of the Sample Apps in depth, learning about powerful features such as container fields, charts, sending email, and barcode scanning. For more details on how to navigate FileMaker apps as a user, see the next lesson in this tutorial. You can get ideas from Sample Apps for how to build a feature, then dig into the app to learn how to build it.